After charges were not filed in the questionable death of a newborn child in Campbell County last Friday, GOP legislators, under the lead of Senator Steve Newman, with the assistance of Attorney General-elect Ken Cuccinelli, Campbell County Commonwealth's Attorney Neil Vener, and Campbell County Sheriff Terry Gaddy are looking to pass legislation to close this loophole in order to protect innocent life in future situations. Deputies were called to a home in the 1200 block of Lone Jack Road in Rustburg about 11 a.m. Friday. The caller said a woman in her early 20s was in labor. When deputies arrived, they discovered the baby had actually been born around 1 a.m., about 10 hours earlier. Investigators said the baby was already dead when deputies got there. Investigators told WSLS the baby’s airway was blocked. They said the baby was under bedding and had been suffocated by her mother. Investigators said because the mother and baby were still connected by the umbilical cord and placenta, state law does not consider the baby to be a separate life. Therefore, the mother cannot be charged. You can read the whole statment regarding the legislation from Senator Newman here. The general problem with the law is that the child was still attached via the umbilical cord at the time of death. In order for charges to be filed in Virginia under the current law the following must be established: (1) the child must have been born alive; (2) the child had an independent and separate existence from its mother; and, (3) the accused was the criminal agent that caused the infant’s death. So in the case number two of the above was not completly true and the mother gets off free. Legislation being put forth will essentially abolish this loophole and will allow charges to be filed if another case like this were to occur. Delegates Kathy Byron and Ben Cline will lead action on this legislation on the House of Delegates side and Senator Robert Hurt will be Senator Newman's co-sponsor in the Senate. This whole situation seems to be a great travesty and certainly a call for action to our lawmakers. The action by Senator Newman as well as the other elected officials who are stepping up to close this loophole should certianly be commended as well as a testament to how fortunate we are in Virginia to have elected officials who consider protection of the right to life a serious priority. Remember: If a person does not have the right to life, all other rights then become unavailable. Rep. Rob Wittman- Wittman is a Congressman who I feel has done a lot in a very short time in office. He has yet to even serve a full term in Congress and has accomplished a great deal especially with the Chesapeake Bay Accountability and Recovery Act. Additionally Wittman has taken steps to be a leader among the House Republicans by working to start the Republican New Media Caucus. Wittman is someone who definitely has leadership potential at the statewide potential but there are many questions on weather Wittman will be able to garner much excitement statewide. Other blogs have been starting to throw out speculation for who will run for the Republican nomination for US Senate to challenge Jim Webb in 2012. This is always fun so why not play the game here too? Del. Bob Marshall- Marshall ran against Jim Gilmore for the nomination in 2008 and lost by a very slim margin in what was another grassroots vs. establishment battle. That run greatly raised the stature and name recognition of Marshall and put him in a great position to run again in 2012. Marshall has been a hero for both life and the taxpayer in the House of Delegates and has begun to take a larger stand against federal government intrusion especially with the legislation he has pre-filed for the upcoming session of the General Assembly in regards to Obamacare. Marshall also had the support of our Attorney General-elect Ken Cuccinelli last year and I see no reason why he wouldn't have his support again in 2012. Since Cuccinelli's profile has risen greatly over the past 12 months a Cuccinelli-backed Marshall will only be one more reason why Marshall could be our next US Senator, especially if the Cuccinelli grassroots organization steps up for Marshall as well. Marshall could have a team of bloggers/internet activists, grassroots volunteers, experienced campaign staffers, and even potential donors lining up to help him in addition to his own seasoned campaign team. My prediction: Running. former Rep. Tom Davis- Who even knows? Davis is sitting up in NOVA playing to the beat of his own RINO drum. I sure hope for the sake of the Republican Party of Virginia he doesn't run, but honestly I bet he will. If he decides to run again I hope we nominate via convention again so he will get scared and drop out again. We'd really just be getting a slightly more moderate Jim Webb. A slight improvement to the current situation would be a great disappointment to the people of Virginia who want a great improvement. I wonder how Davis feels being by himself in his "big tent" Republican party? My prediction: Probably running. Governor-elect Bob McDonnell- No chance in hell of getting him to run. If McDonnell governs like he campaigns, which he has so far with the transition, and decided to run for Senate against Webb we would have another blowout on our hands similar to the one he gave Creigh Deeds in November. But there is no way McDonnell would leave the Govenor's office especially with the large amount of things he wants to accomplish especially when Virginia is different from other states and he will only have four years to accomplish his goals with no hopes of re-election if he falls short of his goals. My prediction: Not running. Lt. Governor Bill Bolling- Bolling wants to be Governor and there is no reason he should give up a shot at that to run for US Senate. None at all. Especially if he and McDonnell prove to be an effective governing team than the voters of Virginia will have no reason not to pick him to be their next Governor in 2013. My prediction: Not running. Attorney General-elect Ken Cuccinelli- I put Cuccinelli in the same category as Bob McDonnell. Cuccinelli has a long list of goals he wants to accomplish as Attorney General and the is NO way he will leave that office short of achieving these goals. The most likely option for Cuccinelli is to run for re-election at this point which he has spoken of many times since his victory in November. As far as Cuccinelli seeking higher office, I feel that the US Senate would be a much better fit for him than the Governor's mansion so I eventually expect him to move that way, but the earliest we will see Cuccinelli make a run for the US Senate will be in 2014 when Mark Warner's seat is up. Expect him and his grassroots army to line up behind Marshall as mentioned above. Just imagine sometime in the near future we could have our US Senators from Virginia be Bob Marshall and Ken Cuccinelli. That would be quite awesome and cause C-SPAN 2 to be one of the most entertaining channels on TV. My prediction: Not running. former Del. Chris Saxman- A lot of people threw out Saxman's name last year and his name has been thrown out a lot in regards to the 2012 seat as well. It will be interesting to see what he does especially since he will most likely working as an education advisor or possibly Secretary of Education under Bob McDonnell. My prediction: Possibly running. In the last week a resolution was passed by the College Republican boards of Patrick Henry College and Christendom chapters. These are the only two CR chapters in Virginia's 10th Congressional District. The resolution was sent via e-mail last night to the 10th District Committee using the e-mail list provided on the committee's webpage. The resolution addresses the issue of the date of the 10th District Convention. In previous years it has been scheduled for the same date as Patrick Henry College's graduation. This coming year both PHC and Christendom have their graduations on the same date (May 15th), and the resolution requests that the convention be scheduled prior to this date so that CRs from both schools can participate. I have been told that this may seem like a ploy to get more conservatives to go to the convention since both schools are pretty conservative. That is not what this is. As college Republicans we believe the party should be encouraging not hindering politically active young people from participating. The two boards that passed this resolution represent the most politically active college students in the district. Some have suggested that scheduling the convention for the same day as Patrick Henry College's graduation has been intentional by Chairman Jim Rich. I am not willing to make that accusation. However, if after receiving this resolution he and the rest of the committee set the convention date for May 15th or a date after it can only be concluded that the 10th District Committee is intentionally trying to keep young people out of the process. While none of the clubs in the district have representation on the committee, we strongly hope that Chrissi Lee (the CR rep to the committee from Virginia Tech) will take this resolution as her own and represent the college republicans in the district at the meeting on December 17th. In this article Patrick Ruffini argues that another front in the war on the establishment is stopping ending the search for self funded candidates. This is a must read article as we prepare for the 2010 election cycle. The lesson here is that fundraising is not an independent variable. Fundraising is a dependent variable and the independent variable is the message. There does not exist an innate ability to fundraise independent of a strong message -- unless the candidate is fabulously wealthy and can self-fund. And in cases where there might be, all the fundraising in the world cannot overcome a poor message. If a candidate is wealthy or has rich friends, but has no message, the GOP should run -- not walk -- away from that candidate. In Virginia this year we elected Ken Cuccinelli, someone who was unafraid to run as a conservative and is unafraid to govern as such. In 2010 we have that person in Florida with Marco Rubio. Marco Rubio is running against Charlie Crist for the Republican nomination for the 2010 Florida Senate race. In the following video Marco Rubio advocates a Republican party that stands up for conservative principles and runs on center right conservative values. Rubio is a conservative, he can win, and Republicans across the country need to stand with Rubio. What is our priority for next year? In a recent interview Erick Erickson made news by saying that his number one goal for 2010 is beating the Republican establishment. Those are sentiments I definitely concur with. Some argue our end goal must be electing Republicans, and after the nomination contests are over that is definitely true, but our number one goal must be advancing conservative principles. We must run viable conservatives in primaries, run them for party office, and hold them and all Republicans accountable after we elect them. We did it this year by electing Ken Cuccinelli, and we will run him for whatever else he needs to run for, my fellow blogger and others tried to do it last spring when they fought to keep Jeff Frederick as party chair, and we must keep up the fight this coming year in the many nomination contests and district chair races across the state next spring. It is as we advance our conservative principles and govern as conservatives that we will win elections, and if the establishment stands in our way, so be it. Convention or Primary in the 5th Congressional District? This Saturday the Republican 5th District Congressional Committee will decide whether to use a primary or convention to nominate their candidate for congress. (Due to recent party plan amendments a canvass could be used, but there seems to be little desire by members of the committee for it.) In Virginia this question is even more important because we have no party registration, and all our primaries are open. Earlier an article was posted on this blog by one of the conventions biggest advocates in the state party David C. Ray (State Central Member from the 10th District). It makes the best most thorough case for conventions, and should read by all members of the 5th District Committee before Saturdays vote. There are two reasons why I think a convention is particularly important in this case. 1. It allows the party to choose its own nominee. In the 5th District the Democrats already have their nominee, and Tom Periello is highly unlikely to draw a primary opponent. There is a long history of partisans on both sides voting in the other sides primary, and with the Democrats not having to hold a primary the chance of Democrats helping decide the Republicans nominee is very high. If the person who runs against Tom Periello will really be the Republican nominee he must be chosen by Republicans. 2. It will make sure the nominee to receive over 50% of the vote. In the 5th District there are about 7 republicans running for the Republican nomination. While some people do receive more than 50% in a three way race (Steve Hunt in the 37th Senate District) it is very difficult for a candidate to top 50% when more than five candidates are involved. The nominee could easily win in a primary with only 30% of the vote. Will the party really be able to unite behind someone if one third or less of the party nominates him? With a convention 50% +1 of the convention is required for a candidate to win. This helps make sure that the eventual nominee is someone a majority of the activists are at lease somewhat happy with. This Saturday I hope the 5th District Committee chooses to nominate its candidate through a convention. I have had no time to look at all the candidates to see who a convention would help or hurt, I generally believe that a convention is the best way for Republicans to nominate their candidates. One of the numerous candidates running for the Republican nomination in the 5th district is long time activist Feda Morton. She has been endorsed by RNC Committeewoman Kath Terry, RNC Committeeman Morton Blackwell, former RPV chair Patrick McSweeney, and PHC Chancellor, HSLDA founder, and former Lieutenant Governor nominee Mike Farris. In a race that has received a lot of interest because of the tax hike votes of presumed front runner Sen. Robert Hurt. Feda seems to be a committed unwavering Christian conservative. For more information about Feda Morton check out her website. It seems this year more attention is being paid by the Democrat Candidates in Virginia to their opponents connections, than stances on the issues. Steve Shannon has attacked Ken Cuccinelli for his connections to the Tea Party movement, as well as his connection to Phil Hamilton. Creigh Deeds used his first TV Add to bring up the spectre of George Bush as he tries to gain ground against Bob McDonnell. In the spirit of ducking the issues both candidates refuse to debate their opponents, and Steve Shannon called Ken Cuccinelli's call for a special session (which ended up being successful) a "political stunt". While political connections are interesting they are most useful when they enlighten us on where the candidates stand on the issues. Recently some pictures were taken that of a Deeds connection that illustrates his position on a critical issue. Why does this matter? This medical facility, A Capital Women's Health Clinic, is exclusively an abortion provider. Unlike Planned Parenthood, they don't try to cover themselves by offering other health services. Among the "services" this abortion clinic provides are abortions for babies 14 weeks old or younger, as well as abortions by pill. In the description of the "Abortion Up to 14 Weeks" the clinic's website says, "This five minute outpatient procedure involves the insertion of a small suction tube into the cervix to remove the contents of the uterus." Are infants no longer even fetuses, but simply contents to be suctioned like the junk in your mouth during a dental visit? It is no surprise that Creigh Deeds is suppported by such a radical abortion group. While he tries to portray himself as a moderate, he has a record that is anything but moderate. He has a record of standing against the right for life at every opportunity, and even recently sided with the founders of the pro-choice movement in saying that abortions are for the "poor and desperate". It is no surprise a man who seems to think abortions should be used to reduce the number of poor people is supported by people who run an abortion clinic. Newt: "We need leaders like Michael Williams"
Besides Ken Cuccinelli, one of the other rising conservative stars is Michael Williams of Texas who is running for senate. 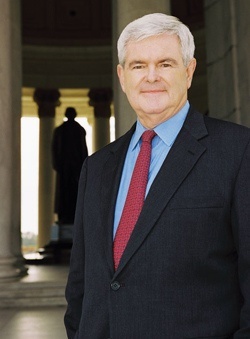 I hope you will join Newt Gingrich in supporting him in his senate run. Having been a part of the last effort to retake the congressional majority, I am convinced we don't have to wait 40 years this time to regain power. Democrats in Congress offer the same old, tired recipe of Democrats past -- big government hand-outs, bloated bureaucracy and big-time deficit spending. The kind of change they offer is simply a return to the discarded practices of the pre-Reagan era. Our problem is not that Americans are newly attracted to Democrat ideas, but that Republicans simply failed to live up to their own ideas. Let me illustrate my point this way: while conservatives continue to embrace the conservative label, liberals have been re-marketing themselves as progressives. You can call a used car pre-owned all you want, but I will be just as worried about the engine going out. We do not need to change our ideas, we need to live up to them. And when I talk about modernizing the Republican brand, I mean using tried and true Republicans principles in new ways to solve new problems. The key to building a new Republican Majority is not simply branding Democrat policies as the destructive and discredited ideas of the past…but offering real alternatives that meet Americans where they are. And offering new leaders not bogged down by the old fights of the last decade. We need conservatives willing to engage the Democrats on the field of ideas…willing to speak of a 21st Century conservatism…willing to stand and fight on principle. We need leaders like Michael Williams. Senator Kay Bailey Hutchison has already announced she will not run for the U.S. Senate again, and may resign her seat in just a few months to concentrate on her campaign for governor. As you can imagine, an open senate seat is a rare commodity, and people of both parties are kicking the proverbial tires to decide if they want to run. But no candidate brings the energy, the proven conservative ideals, and the ability to take the liberals to task while rallying the grassroots of our party like Commissioner Michael Williams. Will you help send Michael Williams to the U.S. Senate with a contribution of $4,800, $2,400 or $1,000, $500, $250, $100 or $50 right now? As someone who has been elected statewide in Texas three times, Michael caught my eye by advocating the right energy policies for America's future. Unlike the liberals who want to bring fossil fuel exploration to a grinding halt and worsen the economic crisis, Michael wants to expand domestic exploration of both traditional fossil fuels as well as clean, renewable sources. With regulatory authority over the oil and gas industry as Railroad Commissioner, Michael has strong credentials when it comes to both energy and the environment. For too long, our party has ceded issues like the environment to the liberals. We are reaping the consequences of our own disengagement on the environment, education, urban renewal, and a whole host of issues liberals call their own. Michael Williams would be a true game-changer in Washington. Not only is he an expert on carbon policy, he is an articulate spokesman for reforming education policy. A former Assistant Secretary of Education under President G.H.W. Bush, Michael not only knows the importance of investing in technical subject areas like math and science, but he stood on the firing line as the lead official who opposed racial preferences in college admissions. Friends, for an African-American to stand up to the liberal advocacy groups on a combustible issue like racial preferences at the age of 37 shows rare courage. But it doesn't stop there. As a member of the U.S. Department of Justice, Michael had a protective detail assigned to him after receiving a death threat for his prosecution of white supremacists in the South. Rare courage has come to define Michael Williams. And such courage warrants our support. I write to you today to ask for your contribution to Michael's Senate campaign. He is not exploring this race, he is in without reservation. Will you contribute $4,800, $2,400 or $1,000, $500, $250, $100 or $50 to the Michael Williams Campaign for U.S. Senate today? Imagine the frustration of liberals in Congress debating energy policy with an energy expert, environmental policy with a knowledgeable conservationist, education policy with an education expert, and criminal justice with a courageous former prosecutor at the federal and local level. They won't know what to do with someone who knows more about those issues than them, and who makes a conservative case for real reform. As you know, I was a foot soldier in the Reagan Revolution. Conservative, Reaganesque principles still work in the 21st Century. But our party would be wise to refrain from rhetoric that sounds like we are tied to the past, and advocate a fresh conservatism that, while building on proven conservative principles, provides new ideas and new solutions for America's problems. The Pelosi Congress is already doing its part to break trust with the American People, turning a stimulus bill into a pork-laden spending free-for-all. The Democrats seem to think that past Republican spending abuses gives them free license to triple the deficit and mortgage our children's future to Chinese banks. This is fiscal insanity. The honeymoon will be over soon, and then we will be stuck with an amazing legacy of debt and wasteful spending for which this generation should be completely ashamed. The first shot we can fire in response to the Democrats' spending abuse is to send Michael Williams to the United States Senate. Will you help fund the first canon shot into the Democrats' firewall? Their fortress may look like it is made of concrete, but just past the outer layer there are large pockets of hot air. 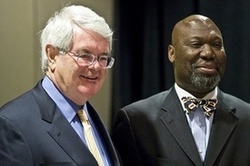 If we fight back with principled candidates like Michael Williams, their ivory towers will come crumbling down quickly. So, what's it worth to you to prevent billion dollar daily interest payments on the debt? To prevent tax hikes on the order of $1 trillion? To elect a conservative who will fight for our values and help us take back the rhetorical turf on the environment, energy, education and the economy? Is it worth $4,800, $2,400 or $1,000, $500, $250, $100 or $50 to you? Interested, but not sure familiar enough with Michael Williams? Take just ten minutes, andwatch a portion of his speech to the Republican State Convention in Texas, which I also attended. You will be sold - that's all it took for me. Let's get to work, and bring substantive change to Washington, not the sound bite version that is ringing so hollow today. Let's elect Michael Williams to the U.S. Senate. P.S. A conservative like Michael Williams comes along only so often. He has the rare courage of someone who has fought the tough fights at a young age. He can take back the Democrats' turf on issues like the environment, energy, education and the economy. I support Michael Williams. Will you join me by contributing $4,800, $2,400 or $1,000, $500, $250, $100 or $50 to his campaign for U.S. Senate today?